Using all steel construction for your new garage results in a longer lasting, better looking, faster to build structure. 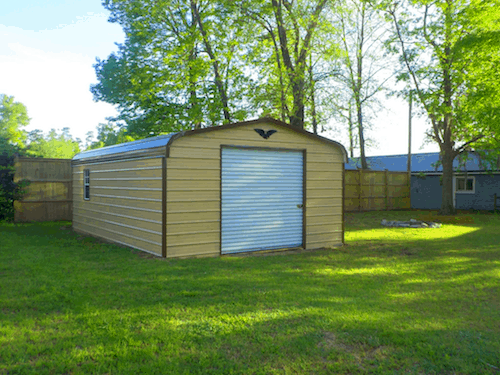 Metal garages are easily customized to work for all kinds of uses, from the homeowner with a single car to the aspiring mechanic expanding their home business. Turning to a pre-assembled or custom metal building is one of the best ways to control the construction costs of a project like a new garage. Other forms of construction can end up costing twice as much as your original quote or more as the need for labor increases or the plans change due to site limitations. Regular roof metal garages just need a stable and level foundation and you've got only the cost of the package to cover. With free installation and delivery from MetalCarports.com, it's easy to stay within your budget. Why leave your favorite car or truck out in your driveway, vulnerable to falling hail and vandals armed with spray paint, when it could be securely stored behind the locked doors of your new garage? You don't need to spend a fortune or wait months for construction to finish when you choose one of our vertical roof garages. The all-steel construction guarantees long-lasting durability, while the convenient frame and panel design dramatically speeds up assembly and installation compared to traditional wood frame construction. Vertical roof metal garages in particular are great replacements for traditionally built garages for a number of reasons. For some homeowners, they're initially concerned about how the rounded edges of a regular roof metal garage may stand out. When aesthetics are your primary concern, you should know about A-frame metal garages before settling for a wood-framed structure. The A-frame steel garages we sell here at MetalCarports.com match the look of your home while still offering the benefits of metal construction. You don't have to choose between the look you want and the value of a metal garage thanks to the A-frame roof style. Steel garages are generally divided into categories based on both their capacities for holding vehicles and their entry point. You'll need to choose from a one, two, or three car design, then pick between front and side entry steel garage buildings. One, two, or three cars? Don’t underestimate your future need for more space. Even if you live alone or share a single car with your spouse right now, you could always add one or two more cars in the next few years. 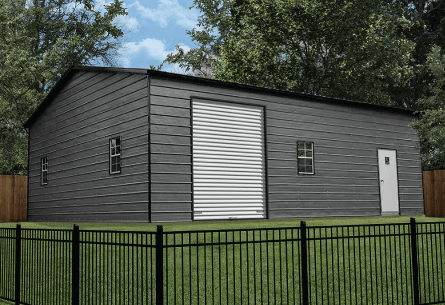 Larger steel garage kits also offer more free space for storage or workshops, in addition to being attractive to buyers if you ever sell your home. Side entry options: Aside from the widest three car models, most metal garages are orientated so the large roll-up doors are located on the end of a building rather than the side. However, we offer plenty of side entry designs as well so you can arrange the garage to take the best advantage of limited lot space and existing driveway layouts. 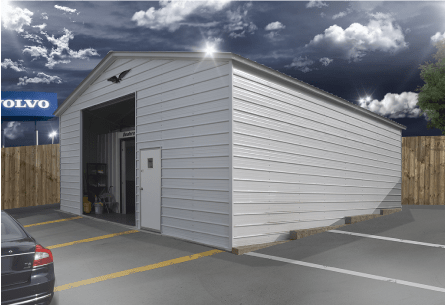 Steel garage kits include a wide enough array of valuable features that they can be used in practically any setting, from residential to commercial. We use 12 and 14 gauge steel for manufacturing all of our metal buildings, including all of the garage designs listed here at MetalCarports.com. Steel is naturally stronger and more durable than the aluminum used for many other metal garages, and our materials are also thicker than the steel used by the competitors. This results in a long lasting garage you can rely on for 20 years or longer. These garages take little work to finish on the interior since the metal framing design makes the addition of insulation and paneling very easy. Regular: Horizontal panels of metal roofing run from the front to the back of the garage and seamlessly cover the entire roof. This is the most affordable option, but it can bear a slightly lower weight load and lower top wind speeds. Boxed Eave: Closing in the eaves and improving the framing to an A-frame design creates a stronger roof while relying on the quick and affordable horizontal layout for the paneling. Most homeowners will find this option perfect for their metal garages. Vertical: When you’re dealing with heavy snow loads or tornado-speed winds, stick with vertical roofs. These designs are built with the panels running vertically so snow and rain drains off as quickly as possible. While you’re responsible for supplying the finishing touches like shelving and lights, we can customize practically everything else for you during manufacturing. Add smaller doors for easy access without opening the garage doors, or include a few windows to enjoy some natural light and ventilation while working on your car. Just because you’re choosing one of our steel garage kits doesn’t mean you’re limited to a few stock designs. Building a workshop so you can finally start your own woodworking or metal shop business. Turn to MetalCarports.com first for all of your metal buildings to enjoy the peace of mind that comes from a 20 year warranty on materials and a 90 day workmanship guarantee on installation. Only we can offer you free installation and delivery as well with all of our most popular packages.